Hertha v Bayern went the full 120 minutes. Bayern were dominant but once again were their own worst enemies as Hertha were the latest Bayern opponent to be aided by lapses made by the Rekordmeister. It was a start with plenty of controversies. 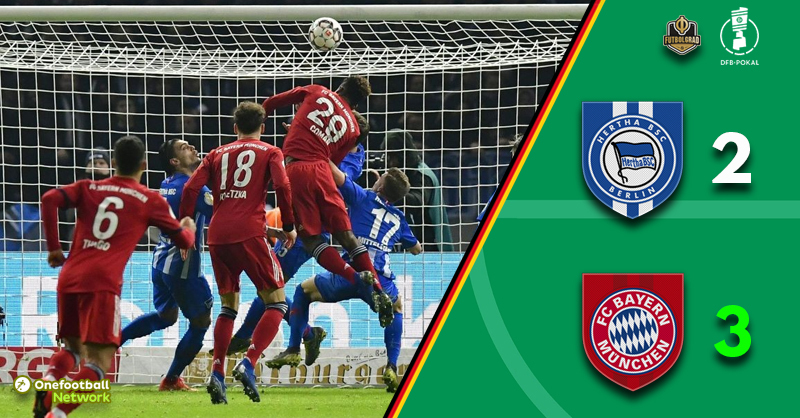 Leon Goretzka was brought down inside the penalty box but was handed a yellow card for a dive, a harsh decision going by the replays, and on the other side, Hertha scored the opener in the 3′ minute. James was dispossessed in midfield, and Hertha quickly played forward, and Maximilian Mittelstädt was given to much room to score from the edge of the box with a low drive that beat Sven Ulreich at the near post. Bayern responded right away. Joshua Kimmich was set up by Serge Gnabry, Kimmich send a cross to the centre of the box where Robert Lewandowski lost his duel to Karim Rekik. Gnabry, however, had followed up his cross and bounced on the rebound to score from 14-yards out. It was an energetic start by both sides. Bayern wanted to impose their usual dominance, and Hertha looked to bridge the midfield whenever winning possession. Gnabry was the most prolific player at this stage and Rune Jarstein, 20′ as well as 25′, had to do well to keep the national team attacking midfielder from adding a second goal at this stage. The German champions dominated the game at this stage. Hertha, in the meantime, struggled to get the ball out of their own half but Bayern could not find a way through the tightly woven defence that the club from the capital had spun around the penalty box. Within three minutes of the second half, Bayern had taken the lead. Not surprising Gnabry was the goalscorer. The attacking midfielder played a fantastic one-two with Lewandowski to break into the box and beat Jarstein with a low drive in the 48′ minute. The goal seemed to settle it for Bayern. The Rekordmeister now circulated the ball but lacked the final consequence when attacking Hertha in the final third and in some ways almost seemed arrogant. It was an arrogance that was punished in the 67′ minute when Mats Hummels played a lazy ball back to Ulreich, the ball, however, was intercepted by Davie Selke and the forward made no mistake to round the Bayern keeper and make it 2-2. Once again a defensive mistake had cost Bayern. The question was now how would Bayern react. At first with more of the same, plenty of ball circulation but with no real penetration into the danger area. Hertha, in fact, found it easy to defend against a Bayern side lacking ideas and efficiency when they did get into the danger area, like when James snuck away from his defence but failed to redirect a David Alaba cross on goal (81′). Hertha, in the meantime, countered and in the 83′ minute Lukas Klünter tested Sven Ulreich with a low shot after escaping David Alaba on the left. Ultimately, neither side was able to break the deadlock, which meant the game headed into extra-time. Bayern’s dominance was finally rewarded in the 98′ minute. Alaba dribbled from the right to the centre and played a dangerous ball in the box where Kimmich played the ball to Goretzka; he spotted Lewandowski, the Polish striker played a high ball back to Coman, who headed the ball across the goal line. Could Hertha answer for the third time in the game? In the 117′ minute, James could have, should have, sealed the deal, James was left wide open at the edge of the box went one-v-one with Jarstein, his shot, however, lacked conviction needlessly keeping Hertha in the match. But, in the end, it did not matter, the club from the capital could not formulate another attack, and Bayern deservedly advanced to the next round. Serge Gnabry was the man of the match. 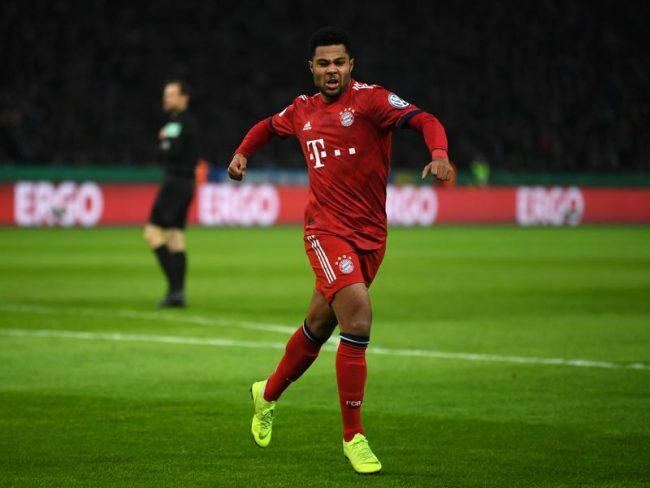 The Bayern winger scored two goals and for long stretches was the only Bayern player on the pitch that could successfully penetrate behind Hertha’s defence. The attacking winger not just scored two goals but also created two chances and was the linchpin for all of Bayern’s attacks until taken off just before extra-time. Bayern were dominant in this one but outdone once again by defensive mistakes. Ahead of Hertha’s lead, James lost the ball needlessly in midfield and Mittelstädt made it look easy against centre-backs Niklas Süle and Hummels. Hummels was also the main protagonist ahead of the second Hertha goal. The defender had a blackout when he played a terrible header back to Sven Ulreich to instigate Selke’s goal. Bayern continue to struggle whenever opponents quickly transition and pressure high and were lucky that Hertha somewhat lacked the quality today. Going into the game Hertha had been undefeated for four games against Bayern. Ribery has made his 410th appearance in all competitions for Bayern and draws level with Lothar Matthäus. Only 13 players have made more appearances for Bayern since the club’s Bundesliga promotion in 1965.